I have to admit right now, on my first listen, I didn't "get it". Although I enjoyed Horrorshow's first two albums immensely, I have since moved on. The first couple listens I skipped through the majority of the songs thinking Horrorshow had disappointed me by only providing more of the same, emotional and soft hip hop that doesn't push any boundaries or take a stance on anything too controversial. But at a second glance I realised that I was looking at it the wrong way. It wasn't until a very late night walk with the dog down near Blackwattle Bay with the air thick, damp and heavy as it is before the rain, my quiet and reflective mood finally latched onto the music and the words. What was revealed to me was something beautiful, dense and meaningful. The meaning behind the words finally stood out to me as though I was stepping out of the fog, and the music provided the perfect backdrop for them to whirl around within. So what I'm saying is don't set this album aside if at first you're not in the mood to embrace it, cause it definitely has the potential to come back and surprise you. This is not a lighthearted album. This is a deeply pensive, listen alone in your room with the lights off type album. Not that there aren't tracks would work in a concert setting, but it's not dancing music. This is sway on your feet with your lighters in the air music. This is the type of music that will make us take a collective breath and just listen, which I think holds much more power than the type that we want to cheers beers to. This isn't The Party Life, in fact there's not one party track here. This is exactly the type of music that works for Horrorshow. This is In My Haze type music. While leaving the party songs and more festival orientated songs alone, you would think that the JJJ crowd might not take to it as readily, but the doesn't seem to be the case at all as Horrorshow fans and new fans alike have seen the album debut at #2 on the ARIA charts. Like it or hate it, it's refreshing to see that this album didn't have to follow the well defined formula in order to achieve success. 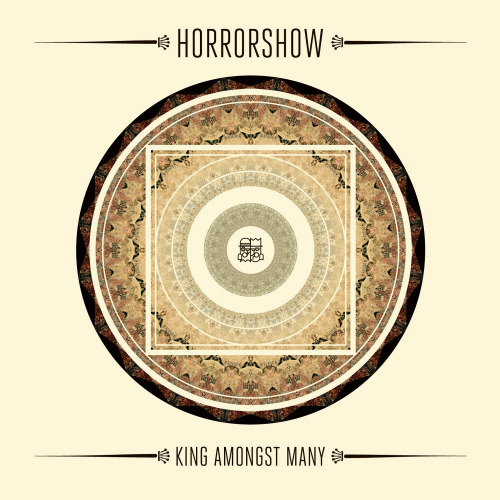 In fact, from the first album right on through to this one, Horrorshow duo never seem to be making music for anyone else at all, simply combining beats that sounds pleasing to them with lyrics that allow the emcee to express to us the inner workings of his mind. That being said, is it on par with the best beat makers in the world? Not by a long shot. Are the lyrics revolutionary and showing us a brand new perspective? Not for the most part. But these two are definitely growing as artists and their music has a place in the Australian music scene and in worldwide hip hop. Though it's not everyone's cup of tea, in terms of emotional content this album is ace. The first listen we had of this new material was during the Hilltop Hoods "Speaking in Tongues" tour. Dead Star Shine was a chilling anthem that made us all stop dead, so to speak. This was a year before the album came out and it had a great response. However the chorus on the finished version leaves much to be desired. I think the effect over Solo's voice lessens the emotion, to where it sounds boring and dull. And that carries on through most of the chorus' on the album. I think as a rule, Solo could work on the expressiveness of his voice, both in singing and in rapping. Though the evenness works one one level, it does make all the songs sound far too similar. And though I love Adit's knack for picking samples, the beats could use more variety as well. Having a few songs with more of an edge to them and a harder hitting beat would surprise us and keep us interested. The song that stood out to me first was Down The Line. This is story telling at it's best. So emotional it nearly made me cry although it's not a particularly sad. Through a story about his ancestry, Solo tells us the importance of family, something that speaks to everyone universally. This is the only track with a female singer as well, Sarah Corry, and possibly the only song that really has the chorus it deserves. The recording of his grandmother at the end is beautiful. Surprisingly out of the whole album the song that turned me off the most is the first single, Unfair Lottery. This is actually what kept me away from the album a long time. I don't think it has the right effect, it doesn't catch you right away and it is not memorable. A terrible choice in my opinion. All it does is remind me that we're ready to see something different from these guys. "They tried to wipe us off of the face of the earth dude, need proof? Look around you." More than a lyricist who throws out catchy puns and one liners, Solo is a poet spinning a story that makes you feel you are in that moment with him if you listen closely enough, and that's something I hold highly. Honesty as well is a trait that is not optional for me, he's certainly not trying to represent anything that he is not, the downfall of many of the more popular hip hop artists.